Axles: 2 - 3,500# Dexter Torflex; 5 bolt hubs, E-Z Lube Hubs; inner bearings, 1.378 I.D. ; outer bearing, 1.063 I.D. Wiring: Sealed modular wiring, 7 Pole Flat Prone Plug. Safety breakaway system with tow charger (battery optional). Flat 4 wiring harness on Hydraulic. 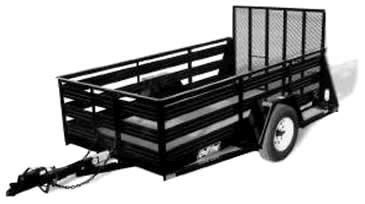 * Please call us for any questions on our trailer redi haul rh12uts 6 rentals in North Dakota and North Central Minnesota.